This corn trial was performed in the summer of 2007 at our Nine Palms project location (no longer in use). Under challenging weather conditions, Silver Queen and Peaches & Cream ranked highest among the four corns tested. Golden Bantam is not recommended. We compared four varieties of sweet corn (Zea mays) to determine the best production and taste. All the varieties were standard corn, not super sweet. Silver Queen is white corn, Golden Bantam and Jubilee are yellow, and Peaches and Cream is bi-color. First, spent fava beans and foxtails were pulled by hand. Six inches of Garrod’s horse compost and a 50 lb bag of alfalfa pellets were spread on the approximately 22 by 22 foot area. This was rototilled on 8 June 2007. Then four blocks were formed with a 2 foot pathway between each quadrant. On June 12, 2007, the corn seeds were planted directly in the ground in furrows made with the edge of a hoe. There were more seeds from some of the varieties so sometimes 2 seeds were planted in each hole. The holes were about 8 inches apart. (Later, the seedlings were thinned to one per hole.) There were about 100 seeds of each variety planted. One week after planting, the seeds had germinated! Initially, overhead sprinklers were used to soak the seedbed and for every other day until the seeds germinated. 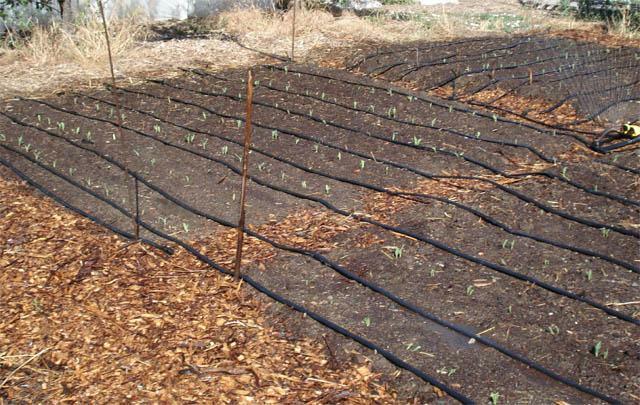 At that time drip irrigation was installed and watering occurred three times a week. Later, a two-inch wood chip mulch was added to control weeds and conserve water. No more weeding was done after this. On July 17th, we noticed two dead corn stalks which had fallen over. Gil set two gopher traps and on July 20th, the gophers had been eliminated. In early August, aphids were noticed on three leaves. Since there were so many, we sprayed with an insecticidal soap. No further problems were observed. On August 10th, the Peaches and Cream variety started to develop silk. Tassels had formed on all four varieties. 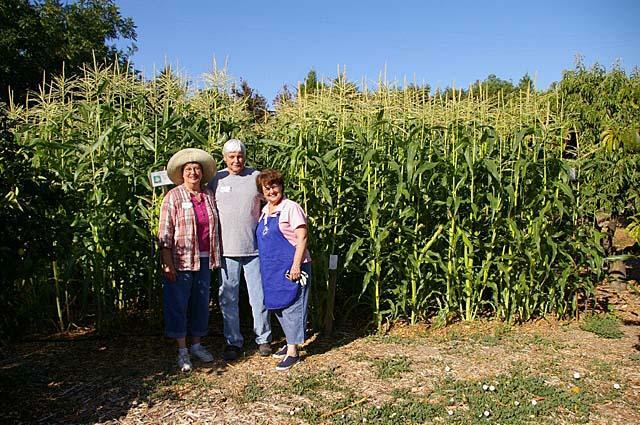 The Silver Queen corn was seven feet tall. 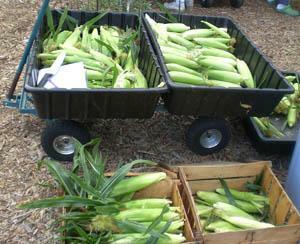 On September 4th, after a spell of extremely hot weather, we picked corn from all four blocks. It was apparent that the corn could have been picked about one week earlier. The rest of the corn was picked on September 7th. For the row of Silver Queen which was next to the Peaches and Cream, some ears had been cross-pollinated. They had a few pale yellow kernels. The Bantam ears were not filled completely and were small, about six inches. The Silver Queen ears were the longest, at about nine inches. Peaches and Cream ears were about eight inches and Jubilee ears were eight to nine inches. It was an interesting project which showed how easy it is to grow corn in this area. Someone with a 10'-by-10' plot could certainly grow one variety. We would not recommend Golden Bantam. Also next time, the ears should be checked earlier to determine if they are ripe. You really can’t tell from the size or shape of the ears with the husk on. Other methods could be tried, including planting at three two-week intervals to spread out the harvesting time. Mulching was very helpful for controlling weeds.